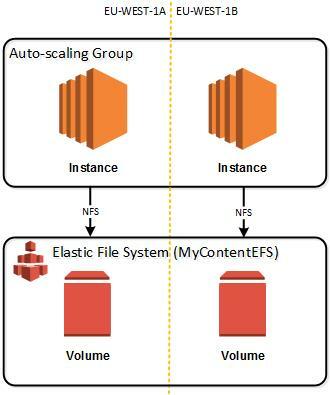 Yesterday in a knowledge session between Solution Architects, the topic of AWS Elastic File System was raised and after a short discussion it was decided to take a closer look and set something up. To quote Top Gear, how hard could it be? From my past, scalable single sources of file system based content were expensive and difficult to deploy. So much so, that product and implementations strategy meant that putting all content in a database was by far and away the most logical route to take. So could EFS now resolve that headache? I will give it a test to find out. What do I have to set up? So I will simulate a website setup where I have an application server tier that would host my Tomcat (or similar) application servers and a back end file system which will be mounted as to my application servers so that the files can be used. Onto my file system I will deploy my content. I won’t install or configure Tomcat, this is simple to do but covered very well in other places. For my auto-scaling group, I have gone and created a simple one and it is up and running across my two availability zones. I have gone and terminated an instance or two just for fun. That’s not related to this post, it is just fun to terminate something and watch it auto-magically reappear. I can now create my EFS for my website content. Then I configure the optional settings. I have chosen to give it a friendly name and stuck to the default “Performance Mode” of general purpose. The final review step and then I am done. That was it. No configuring disk sizes, difficult calculations on my requirements of how much content I have. It’s done. After a shirt whole my volumes are ready and I can keep track on the status of creation in the main EFS dashboard under “life cycle state”. Step 3: Mount your file system using the DNS name. Once that is done I can switch to the directory and create myself a simple index.html file for my eventual Tomcat server to see. If I then log on to my other instance, I can see that my file has been replicate from the first availability zone to the next. This means, if I would write my content to disk as I have done, it would be available instantly in the other availability zones and all my sites would be updated. As I did this manually, if my auto-scaling group scales then I would need to do this each time. This defeats the purpose of auto-scaling. However, if I mount this directory at instance initialization time (e.g. chef) then it would be mounted when my new instance starts. To test this I made a very simply launch script and updated my Launch configuration (made a new one as edits are not possible) to add the following to the user data portion of the configuration. Warning: I would not use this code in production. No really, please don’t. The most complicated thing about this is to mount the drives as creation of the fully managed and scalable storage is incredibly easy. 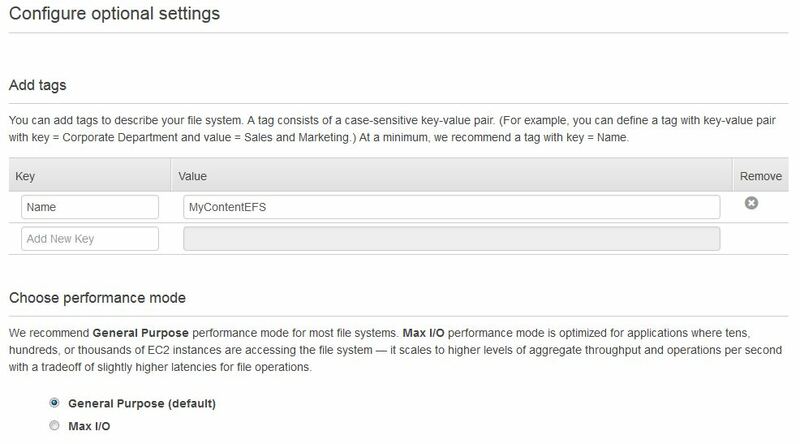 For content management systems, like SDL Web (Tridion) this is a real help in deployment of content in a scalable and reliable way.